This entry was posted on Monday, October 8th, 2007 at 6:49 pm and is filed under tools. You can follow any responses to this entry through the RSS 2.0 feed. You can leave a response, or trackback from your own site. YES! Yes!! YEs!!!!! YES YES YES YES YES YES YES. Note: I am slightly excited about this. Haha! Excited? Never would have guessed. You’re so low-key! This is fantastic. I went to the Danbury site. I looked up Da Vinci code and the tag cloud worked the way I had hoped. When I clicked on Magdalene, I got a list of related books. I love having access to the tag cloud. I know about and have visited LibraryThing, Flickr, de.li.ci.ous. I even have accounts, but I have not really participated. 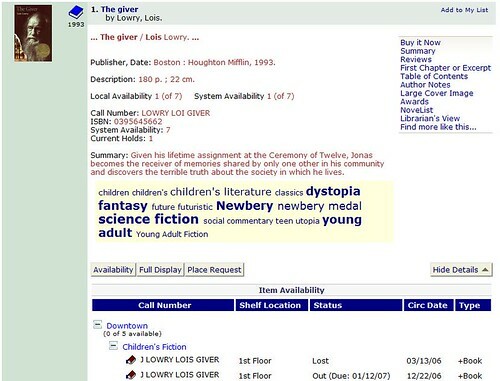 This makes me want to catalog my own library on LibraryThing. 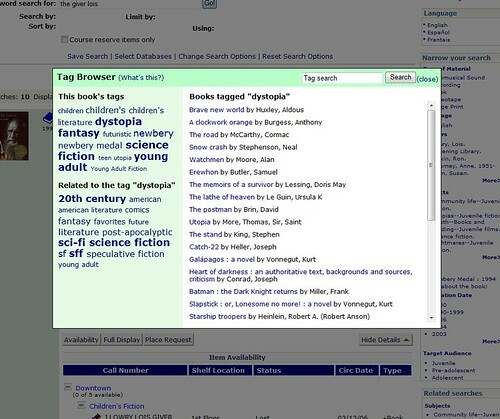 To be able to share my interests and my own tags with so many others in my own public library system is intriguing. I catalog materials for a school district. We don’t feel comfortable adding so many subject headings on the MARC record. The headings have to be accepted Sears subject headings. But, with the tag cloud, you have all the connections that a wide variety of people made. Some of these tags speak to me more than others. By the way, Steve, I notice that you are with my own Pierce County Library System, the best system around. I suspect you have something to do with many of the wonderful new services available at PCLS. Thanks for all you do. It was mentioned that the Library Thing partnership with Polaris would have some progress after this year’s PUG. I haven’t heard anything yet. I’ve already emailed them and I am just waiting to hear back. Great blog! Really good and useful content. Your comment gave me motivation to check back with Polaris myself. I’ll let you know what I find out.